The two-story brick apartment building at 1414 Thirteenth Street in Lubbock, Texas, no longer exists. In Google Street View, you can see that there’s a parking lot there now, where the apartment building stood, in March of 1934. The apartment building where a widowed woman, Nettie Hyburnia (Cottrell) Holley was the manager, in March 1934. Where she and her one surviving child, Myrtle, had been living in a less desirable basement apartment. Where, when a first-floor apartment became available, Nettie was thrilled that she and Myrtle could move into the better apartment. Where, on Wednesday, the 7th of March, 1934, she took gasoline-based cleaning supplies up to scour the bathroom fixtures. Where she opened the bathroom window because of danger from the fumes. Where the air from the window drove the fumes out to the living room, where there was an open fire. Where, just after 11 a.m. that Wednesday, the fumes from those cleaning supplies ignited … and exploded … trapping Nettie in the burning bathroom. 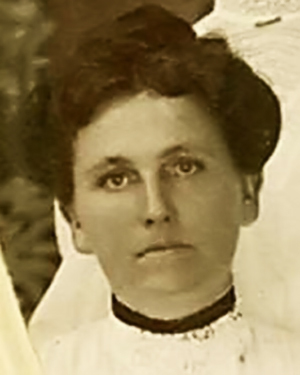 Nettie — my grandfather’s older sister — had never had an easy life. A second daughter, Myrtle, was born on 2 March 1909 in Wichita County.11 This second child was healthy — and you have to think that Nettie thought life was finally going to be what she wanted it. Nettie found herself a widow with a child to support. And by 1934, she and Myrtle were living in Lubbock. Where the gas fumes exploded into flames. It was a fight she couldn’t win. The last photo you see here is the last photo ever taken of Nettie. That fact alone makes it poignant. But even more poignant is the writing on the back, in the careful script of my grandmother, Opal (Robertson) Cottrell. She couldn’t go to the funeral, you see. She was in the late stages of a difficult pregnancy; she had to stay behind and only my grandfather Clay Rex Cottrell traveled from Midland for the funeral. And today, 80 years after you left us, we remember you. That’s a very sad story, but very well told. Thanks for sharing it with us. Thanks for the kind words, Renate. It is so very sad. What a story, Judy. It gave me goosebumps! Though life was not easy for anyone during the Depression era, Nettie had more than her share of burdens and heartbreaks. I bet she’d be happy to know she’s still being remembered 80 years later though, because of what you’ve written today. Thanks for the kind words, Pat. It is such a sad story, isn’t it? Thanks for sharing this, Judy! As family members, and as genealogists, it is very important for us to remember and give tribute to those who had tragedies in their lives, as well as those who had “better” lives. And you do this so well!! Thanks, Mary Ann! The tragedies of our family history are a little like leavening for the bread. Without it, life’s story is flat. Do you have your Cottrells in a family tree on Ancestry? I went to check my tree when I saw you mentioned Holley and noticed I have Cottrells, too. Not my direct line, but Lucinda Cottrell in Texas married a William Cullom. My Holleys (not direct line)came from Arkansas to Tx/Ok. ps. I am the one related through the BATTLES line. Hi, Cynthia! I do have my Cottrells there — check your email for the link to the tree. Very powerful story of your ancestor. It really shows how piecing together someone’s life from bits and pieces can result in a family memory to preserve forever. Thank you for sharing this. Such a sad story. Sometimes when I think I’m having a bad day, I think back to my ancestors and realize how good I really have it. Keeping our ancestors memories alive is so important. There sure are a lot of things they had to cope with that — fortunately — we don’t! Keeping that in mind does help when things get tough for us, doesn’t it? I am sad because of this tragic story, but I am in awe of your ability to tell it. I envy your writing skills and the depth of your feelings. What a nice thing to say, Annick! Thank you. It is a sad story, for sure. I’m glad you think I did it justice. Such a well told and moving story. Poor Nettie, her life was so hard and every time it seemed to be looking up, things fell apart. Last photos are so poignant. I wish I had known more about her, Kristin. I’d like to at least think that she got a lot of joy out of her daughter, Myrtle (who was a gem — we have some lovely photos of her and she did live and prosper and marry and there are descendants I’ve been in touch with), and that she had some peace in her life before this tragic end. Judy, what a tragic story but as others have said, you told it so beautifully. I had chills and tears as I got to the end. Thank you for sharing Nettie with us. Thanks for the kind words, Debi. Much appreciated.